Serie A side Lazio will reportedly make an attempt to pursue Davide Zappacosta from Chelsea, should they fail with an approach for Manchester United's Matteo Darmian. 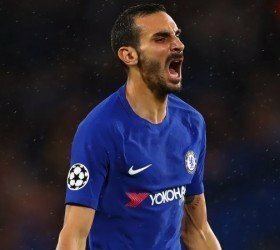 Zappacosta joined the Blues from Chelsea during the summer of 2017 and he made 22 league appearances during his maiden season with the west London side. However, he has not enjoyed the same run of form this term with just two league appearances to date and this has increased the speculation of him leaving the Blues. According to The Mirror, the Italian side are keeping tabs on the proceedings of Zappacosta and they could make an approach for his services, should their bid to sign Darmian fall through. Just like Zappacosta, Darmian made a name for himself during his time with Torino but he has not managed to assume a regular role at United and has racked just four league appearances this season.